Sweet Hollywood presents a fabulous 5 tier Vintage Lace Wedding Cake / Engagement Cake that we have crafted for display purposes for our potential bride and groom looking for something different. 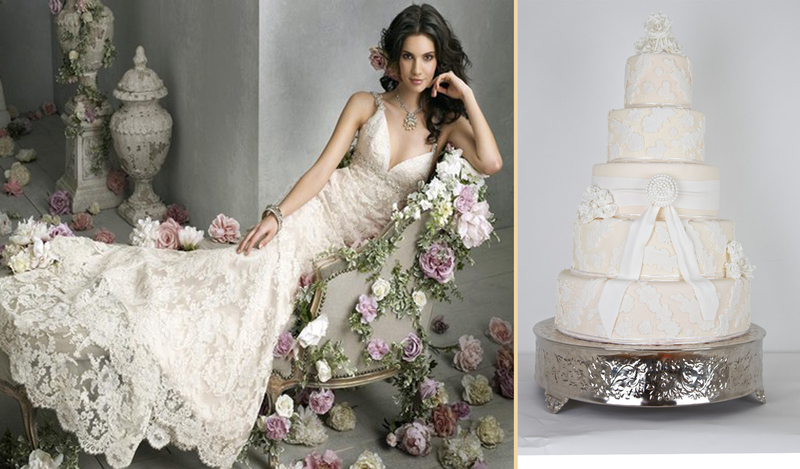 The Vintage Lace Wedding Cake / Engagement Cake features small bunches of handmade roses, lace detailing and slash in the middle of the cake to give it a beautiful focal point. All Sweet Hollywood cakes are carefully crafted using only the finest of ingredients and Eggless Wedding Cake options are available. All cakes are baked and created to perfection, our Egg and Egg Free Wedding Cakes are delicious and we have a reputation on delivering the best from start to finish. View some of the delicious flavours available from our flavours section. The bride that features in the gallery is where some of the inspiration for this cake has come from.